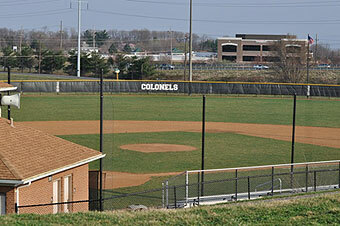 The James Wood Baseball facility is named after the former Frederick County School Board Chairman R. Charles Hott. Mr. Hott spent 18 years on the school board and 13 1/2 as its chairman (1982-1995). He is a former president of the James Wood Athletic Association from 1984-1986. He also contributed to Colonel Athletics as a baseball scorekeeper and announcer for more than two decades. Mr. Hott threw out the ceremonial first pitch on Friday, April 17, 1998, for the first ever baseball game at the Ridge Campus.